Sunday's Jumper Derby Day featured speedy jumper rounds. 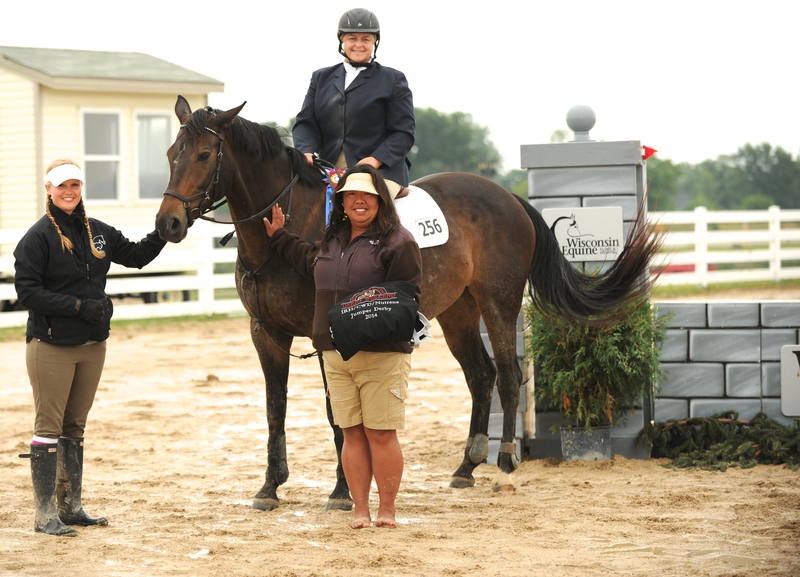 West Bend, WI – August 18, 2014 – Old Seoul Equestrian hosted another great day of Derby riding Sunday during the Wisconsin Equine Derby Weekend at the Washington County Fairgrounds in West Bend, WI. The show started with a fantastic brunch under the tent sponsored by GastroGuard/UlcerGuard with a Bloody Mary bar sponsored by Foremost Stables of Dousman, WI. Some overnight rain didn't dampen the spirits of exhibitors as they walked the Jumper Derby course for the day. Great sponsor jumps and jumps created by Doug Fromm made for an inviting course for riders to apply their new skills learned from clinic day. 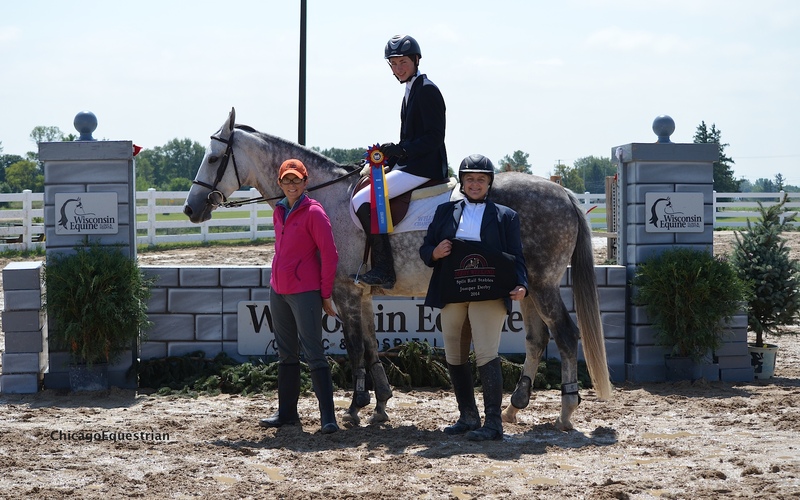 Patty Van Housen and Roc of Angles won the IRH/CWD/Nutrena 3'6" Jumper Derby. Photo by Andrew Ryback. The feature event for the day was the IRH/CWD/Nutrena 3’6” Jumper Derby. The best of the field was Patty Van Housen and her Roc of Angels, a Roc USA baby. 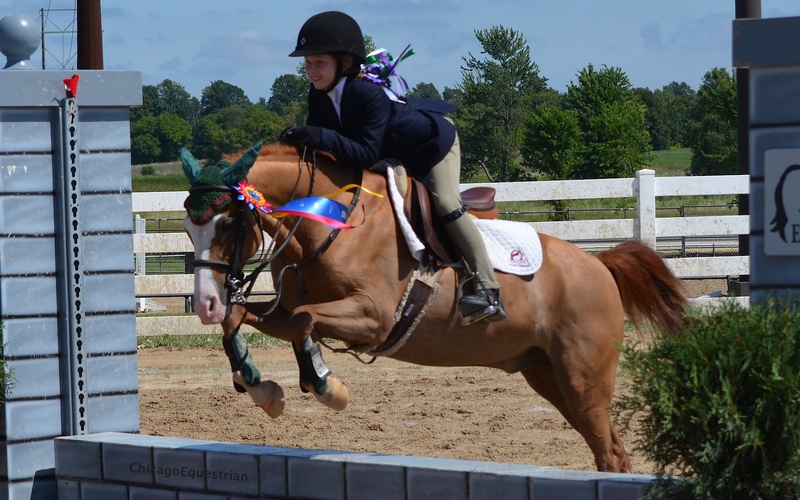 The young horse put in a clean round in the fastest time for the derby win. The Van Housen’s have been great supporters and sponsors of the derby weekend since it’s inception. They bring horses to compete and sponsor a derby in additional to being advocates for the event. Riverwalk and George Schumacher with Split Rail Stable sponsor Patty Van Housen. Riders could participate in a Blue Ribbon Round for the remainder of the day along with their chosen derby height. Winners of the 3’ Split Rail Stables Jumper Derby were Riverwalk and fourteen-year-old rider rider George Schumacher. The handsome eleven-year-old gray horse and tall young rider navigated their way around the course earning them the top honor. "We ended our summer season (last year) at the first annual Old Seoul Derby Weekend. It was one of the most enjoyable shows I have ever been to. They host a 4’ Mini Prix and a 5 Bar Challenge, which you don’t get to see at every show. Everything always runs smoothly and is very relaxing," said Schumacher. "When I was on deck, Patty (Van Housen) came up to me and said, 'It’s all about having fun.' One of the quotes I will always remember that she also told me in that brief conversation is to not race against everyone else but to race against yourself because it doesn’t matter what they can put on the timer but what you can. I will always carry that advice with me, forever," said Schumacher. Schumacher continued, "One of the best qualities about River is that she always gives 110% every single time. 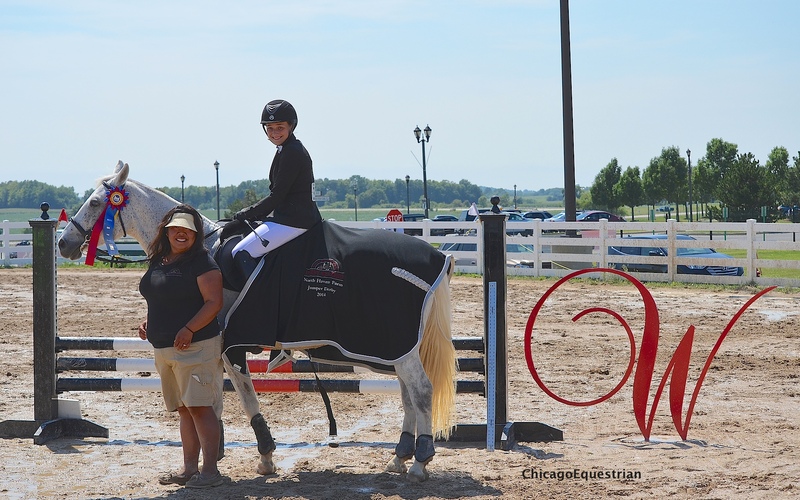 I would like to thank Mary Skarsten, my trainer, Courtney (Hayden-Fromm), Brenda (Mueller), all the sponsors for putting on a great horse show, Diane Carney for the very productive clinic, and Patty for the great advice I will never forget." James Cricket with rider Danika Salaj won the North Haven Farm 2'6" Jumper Derby. The 2’6” North Haven Farm Jumper Derby had James Cricket with Danika Salaj in the irons at the top of the pack. The pair ended up the fastest clean round out of the biggest field of the day. Special Effects and Phoebe Martin take a victory jump. The last event for the day was the 2’3” Blue Ridge Jumper Derby with the smallest mount being the fastest; the win went to Special Effects and pilot Phoebe Martin. The pair galloped the track hopping the jumps with pigtails flying for the top prize. Special Awards were given to the following horses and riders for their outstanding achievements. Hayden-Fromm wraps up the weekend by concluding, "I've always been passionate about horses, their riders and the industry. The Wisconsin Equine Derby Weekend creates an atmosphere that promotes all of the above. Many, many thanks to all who make this event so special! The success of Derby weekend has very little to do with me alone, it's really about a community and all those who participate make a huge contribution." 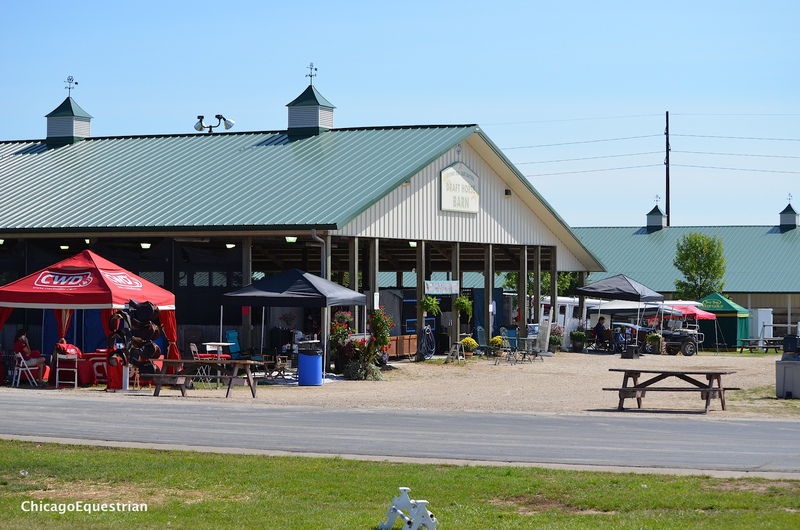 The weekend event includes a clinic day with top professionals in the industry, Shop the Sheep Barn filled with equine related shopping along with fun events and hospitality for the entire family. Great sponsors provide abundant top of the line awards for exhibitors and the show provides the ultimate competition experience with quality jumps, courses and judging. The event is set for August 14-16, 2015 at the Washington County Fairgrounds. For sponsor information contact Courtney Hayden-Fromm at cshayden@yahoo.com. For more information or a prize list, please visit www.oldseoulequestrian.com.